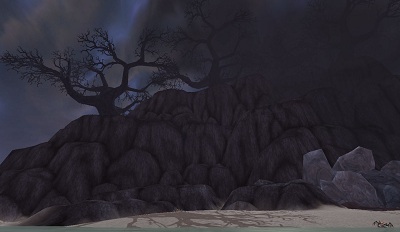 It’s the first full week of the month, so the Darkmoon Faire is open once again. 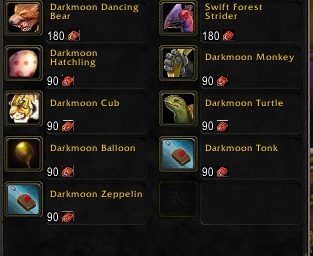 Easy profession skillups and the XP-gifting carousel are the typical draws, but Darkmoon Faire is both a pet collector’s boon and curse. That’s 7 pets just sitting there waiting to be claimed. The Darkmoon Balloon doesn’t fight, but it’ll add to your unique pet total. The Darkmoon Zeppelin is particularly of interest… it makes beating the Thundering Pandaren Spirit Tamer far easier (more on that in a different post). But boo, look at all those tickets you have to earn. If you only do the Faire on one character it’ll take months just to get all of those guys. There are 2 battleable pets only available at the Faire, too. They’re even generally lower level, so it’s easy for even novice battlers to win a Flying Darkmoon Glowfly. 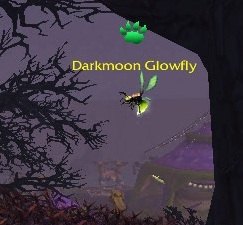 The other battleable pet is only obtainable as a second to the Darkmoon Glowflies above level 5. The Crow is functionally identical to the Gilnean Raven, but is another slot in your unique battle pet arsenal. It took me nearly a half an hour of battling Glowflies and their hangers-on that my typical battle team annihilates in a couple turns just to get a crummy gray one, so if you have Flying upgrade stones to spare this may be a good pick to burn it. If you don’t fight Crows, some of the other seconds include seagulls and roaches, if you need one of those. But the Darkmoon Faire isn’t just for low-level tamers. 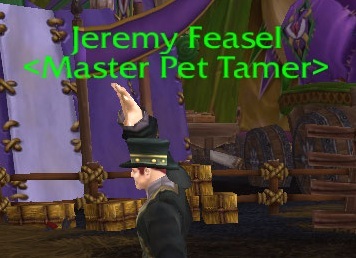 For the cost of one Darkmoon Token per try, you can challenge Jeremy Feasel to a pet battle. 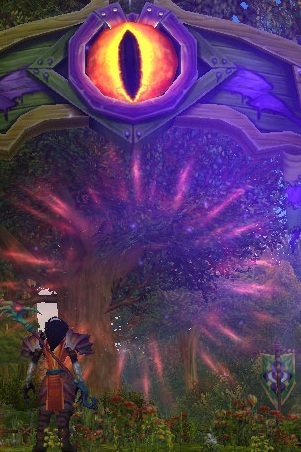 If you win his daily quest you get a special bag of Darkmoon Pet Supplies, which has a chance to drop the Darkmoon Eye. ooooh! But no upgrade stones. boooo. Keeping in the ‘boo’ theme, one of these 12 pets is obtainable only by fishing. And fishing. And FISHING. If you don’t have fishing, that’s fine. These waters are very low level, so with a regular old fishing pole, the crappiest lure you can buy, and a fishing trainer on the dock you’re on your way to wasting hours of your life to get this little bugger. You can also get the Sea Pony from your server’s AH. Personally, I’ve been intending to level fishing anyway, so I’ll keep fishing. And. fishiiiing. And watching TV, and drinking box wine. 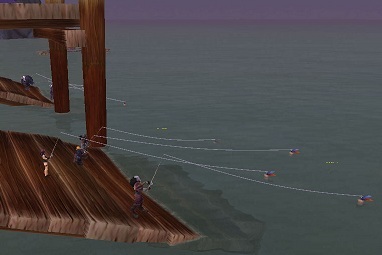 How else would you fish in-game? So, that’s eleven pets accounted for. The twelfth? This menacing location is home to a difficult boss world boss with sharp pointy teeth. If you’re able to join a raid which is able to kill the rabbit (which is a somewhat dicey proposition), in my experience it is quite likely the rabbit will be ninja looted by the group leader or otherwise fought over or ransomed. So, good luck. If you are very lucky the raid member who won it will drop the Darkmoon Rabbit on your auction house, and then you can buy it for 100,000g, give or take. It’s Darkmoon Faire time again. Enter, if you dare, pet battler. This entry was posted in Uncategorized and tagged Crow, Darkmoon Faire, Darkmoon Glowfly, Fishing, Raid, Sea Pony on March 4, 2013 by Liopleurodon.